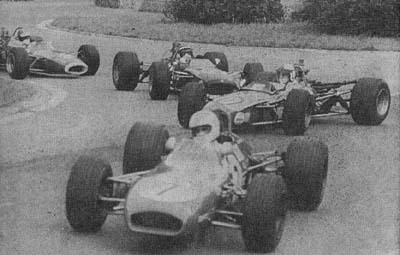 A huge entry, including virtually everyone of importance on the international F3 scene was in Rouen for the annual running of the F3 International Trophy race in 1969. While the race had been one of the curtain-raisers for the F1 meeting the previous year, the demise of F1 at Rouen had thrust the F3 cars firmly into the limelight. Ronnie Peterson, who had elected to compete in the F2 race at Monza on the same weekend, was the only big name missing when the entries came in for Rouen. The ever-popular Brabhams turned out in force, led by Aussie Tim Schenken in his BT28, while other BT28s arrived in the hands of Mike Beuttler, Jean-Pierre Cassegrain and Ulf Svensson. Earlier BT21 or BT21Bs were driven by Freddy Link, Richard Scott, Bev Bond, Bert Hawthorne, Rolf Tellsten, Eddy Jacobsson (all BT21Bs), Pierre-Yves Gaggio, Wayne Mitchell, Natalie Goodwin and Bill Gowdy (BT21s). Etienne Vigoreux had an F2 BT23, while Jean-Pierre Alie had an ancient BT15. There were many Tecnos as well, with examples for François Mazet, Jean-Pierre Jassaud, Jean Blanc, Patrick Champin, Jurg Dubler, Cliff Haworth, Peter de Meritt, Alain Francesci, Lionel Noghes, Bernard Baur, Peter Gaydon, Graham Goodman, Bernard Plaisance, Trevor Blokdyk, Lars Lindberg, Alain Boudier, Francois Libert and Pino Babini. Most of these had Novamotors, except Gaydon who had an EMC in his Tecno. Plenty of Chevrons arrived as well, led by Rene Wisell in the works B15 and Peter Hanson, Rene Ligonnet, Cyd Williams, Howden Ganley, Giorgio Pianta and Brendan McInerney also in B15s. Older 1968 B9s were entered for Barrie Smith and Barrie Maskell. Lotus had four representatives entered, Roy Pike, Mo Nunn, Mike Beckwith and Freddy Kottulinsky driving 59s. 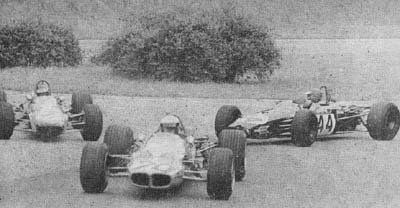 Patrick Depailler and Jean-Pierre Jabouille had works Alpines, while the surprise winner of the 1968 race Adam Potocki and Max Bonnin had two 1967 Matra MS5s. Jacques Laffite had the lone Martini and Mike Campbell brought his Mk3 Titan, while two Merlyns, an Mk14A for Pablo Brea and an Mk10 for Andy Sutcliffe were entered. Pygmee entered two cars for Jean Sulpice and Paul Tucom, and Jean Max rounded out the big field with his Grac M78. More than 60 cars made their way onto the track for practice on Thursday and Friday. Thursday times were generally slower, with Wisell managing the best time of 2m 20s, from Schenken at 2m 20.2s. Mazet was a second slower with 2m 21.3s, while Dubler, Blanc and Cassegrain all posted sub 2m 22s times. Wisell’s time from Friday blew the Thursday times out of the water with a stunning 2m 16.5s, but this time looked a tad optimistic, as even Wisell’s mechanic timed him at around 2 secs slower. Nevertheless, Pike was named as officially second fastest with 2m 18.3s from Beuttler at 2m 18.6s and Mazet at 2m 18.8s. Schenken, Maskell, Hanson and Blanc all managed to get below 2m 20s. Controversy erupted after practice, and it seemed for a time that there would be no racing at all on the weekend. The organizers in their wisdom decreed that starting money would only be paid to drivers reaching the final and only then after they had completed five laps! The drivers, led by Mike Beckwith, objected to racing for nothing, and a document was produced stating that the drivers would not race unless 1000 Francs was paid to those who qualified for the heats. All the drivers signed it, and just as it seemed the stand-off would result in no racing, the organizers relented and agreed to pay a minimum of 500F for the heats and a further 500F for the finalists, thus breaking the deadlock just 20 minutes before the first heat was scheduled to be run. The first 12-lap heat featured a battle between Schenken, Wisell, Beuttler, Bond, Hanson, Depailler, Scott and Campbell, with Campbell forced to retire with one lap to run when his points broke. Schenken held off Wisell by just .3s at the flag, with the first seven cars separated by just 2 seconds. The second group of cars was contesting just as keenly, with Pianta holding off Jassaud, Kottulinsky, Beckwith and Nunn to the flag. Ganley was 13th from Laffite, Gowdy and Smith. Cassegrain broke a rocker arm, Francesci, Noghes and Vigorous all struck distributor problems and Plaisance, Svensson and Blokdyk retired with engine maladies. Heat 2 was around 90 seconds slower than the first, due to the fact that the two pacesetters Schenken and Wisell had both started Heat 1. 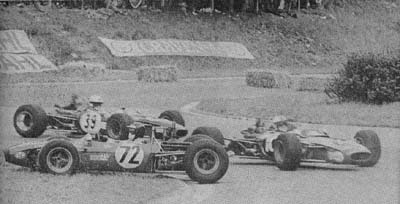 A close, slipstreaming affair featured 12 cars in a tight bunch, which was reduced to 11 when Blanc spun at the hairpin and covered Pike’s car with a shower of dirt, Pike forced to retire shortly afterwards with a broken rocker arm. Blanc fought back from his spin to catch the leaders once more, but in his exuberance he hit a barrier, cracking a wheel and breaking a roll bar link, but continued nonetheless. In the end Mazet held off the pack to win by little more than a wheel from the charging Blanc. Williams finished 3rd, recovering well after an early spin, with Gaydon 4th ahead of Maskell, Gaggio, Haworth, Link and Jabouille. Goodman, Bonnin, Tellsten, Sutcliffe and Boudier a lap down, with de Merit badly delayed by a broken throttle linkage well back, rounded out the finishers. Hawthorne and Liggonet eliminated each other at Scierie in a big accident that destroyed both cars but injured neither. Dubler suffered a broken gear selector, Baur a broken camshaft, Champin a stretched valve, Lindberg oil pressure problems and Goodwin a holed radiator. Brea crashed in practice and didn’t start, while Mitchell’s car refused to start on the line and was pushed back into the pits. The final was contested by 24 cars, the top 12 from each heat qualifying. The flag dropped a just 30 secs after the 2min board was shown, catching most off-guard. Mazet was the beneficiary, leading after lap 1, with the rest of the field close behind. Wisell made his way past Mazet on lap 2 at the hairpin, ahead of Beuttler, Blanc, Schenken, Gaydon, Depailler, Maskell and Jassaud, with a small gap to Bond, Beckwith, Scott, Hanson, Pianta, Kottulinsky, Link, Haworth, Bonnin, Nunn, Goodman, Williams, Tellsten and Gaggio, who had just ended Jabouille’s race by sliding into him at the hairpin and bending the Alpine’s steering. Suddenly Wisell’s brief run at the front came to an end, as he coasted to a stop before getting out of his stricken Chevron. Beuttler thus passed the pits in front after two laps. On lap 4 Blanc made his way to the front from Mazet, Schenken and Beuttler, but the lead was changing regularly. Blanc led on lap 5, with Schenken ahead on laps 6 and 7. Beckwith retired on lap 5 with gearbox problems, while Haworth parked with engine failure on lap 6. Maskell was next, his car succumbing to a broken rocker arm. Bond hit the front on lap 9, despite a failing clutch. He led until lap 14. Nunn retired his struggling Lotus, while Scott had a bad accident at Scierie when he slid under the sleepers on the left of the corner, destroying his BT21 but emerging unscathed. Blanc’s untidy race finally came to an abrupt end when he got sideways on the grass at the downhill section leading into Six Frères. His car crossed the road, rode up the bank and barrel-rolled a number of times before coming to rest. Blanc was lucky to emerge with just broken ribs and a broken leg from the horrifying crash. After 15 laps Schenken had regained the lead from Bond, with Depailler, Mazet, Jassaud and Gaydon close behind. Bond got back in front on the following lap, but just three laps from the end his clutch finally failed altogether, forcing him to retire at the hairpin, to applause from the big crowd. With a lap and a half left, Mazet had the lead from Gaydon, Jassaud, Schenken and Depailler, but then Depailler dropped out with a broken valve. Mazet led the last time round the hairpin, but Jassaud got everything right to take the lead and hold on by a length from Schenken at the flag. Mazet and Gaydon finished side-by-side, with Mazet getting the no for 3rd. Williams, Kottulinsky and Hanson rounded out the top 7, all covered by just 2.1secs. After a big gap Link came home 8th, ahead of Pianta, Bonnin, Goodman and Gaggio, with Goodman the final finisher a lap down. Bond claimed the fastest lap with a 2m 18.3s time, while Jassaud’s win gave the locals plenty to cheer about, coming just one year after his terrible F2 crash at Monza.